Maharana Pratap was born in 1540. Rana Uday Singh, the Second, of Mewar had 33 children. Among them, the eldest was Pratap Singh. Self-respect and virtuous behaviour were the main qualities of Pratap Singh. He was bold and brave right from his childhood and everyone was sure that he was going to be a very valiant person as he grew up. He was more interested in sports and learning to wield weapons rather than general education. Coronation: During Maharana Pratap Singh’s time, Akbar was the Mughal Ruler in Delhi. His policy was to make use of the strength of Hindu kings to bring other Hindu Kings under his control. Many Rajput kings, abandoning their glorious traditions and fighting spirit, sent their daughters and daughters-in-law to the harem of Akbar with the purpose of gaining rewards and honour from Akbar. Uday Singh appointed before his death, Jagammal, the son of his youngest wife as his heir although Pratap Singh was elder to Jagammal but he was ready to give up his rights like Prabhu Ramchandra and go away from Mewar but the chieftains did not at all agree with their king’s decision. Besides they were of the opinion that Jagammal did not possess qualities like courage and self-respect which were essential in a leader and king. Hence it was collectively decided that Jagammal would have to sacrifice the throne. Maharana Pratap Singh too gave due respect to the wish of the chieftains and the people and accepted the responsibility of leading the people of Mewar. Battle of Haldighat: Akbar tried his best to bring Rana Pratap under his clutches; but all in vain. Akbar got angry as no compromise could be arrived at with Rana Pratap and he declared a war. Rana Pratap also started preparations. 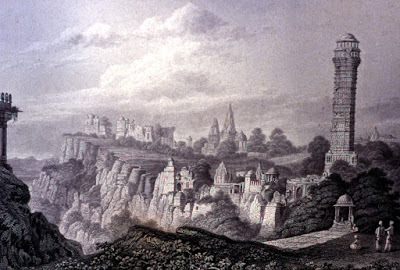 He shifted his capital to Kumbhalgad in the Aravalli range of mountains which was difficult to access. He recruited tribal people and people dwelling in forests in his army. These people had no experience of fighting any war; but he trained them. He appealed to all Rajput chieftains to come under one flag for Mewar’s independence. Rana Pratap’s army of 22,000 soldiers met 2,00,000 soldiers of Akbar at Haldighat. Rana Pratap and his soldiers exhibited great valour in this battle although he had to retreat but Akbar’s army was not successful in completely defeating Rana Pratap. Along with Rana Pratap, his faithful horse named ‘Chetak’ also became immortal in this battle. ‘Chetak’ was seriously injured in the battle of Haldighat but to save his master’s life, it jumped over a big canal. As soon as the canal was crossed, ‘Chetak’ fell down and died thus it saved Rana Pratap, risking its own life. The strong Maharana cried like a child over the death of his faithful horse. Later he constructed a beautiful garden at the place where Chetak had breathed its last. Then Akbar himself attacked Rana Pratap but even after 6 months of fighting the battle, Akbar could not defeat Rana Pratap and went back to Delhi. As a last resort, Akbar sent another great warrior General Jagannath in the year 1584 with a huge army to Mewar but after trying relentlessly for 2 years, even he could not catch Rana Pratap. Severe destiny: Wandering in the jungles and valleys of the mountains, Maharana Pratap used to take even his family with him. There always used to be the danger of the enemy attacking at anytime from anywhere. Getting proper food to eat was an ordeal in the forests. Many times, they had to go without food; they had to wander from one place to another without food and sleep in the mountains and forests. They had to leave the food and immediately proceed to another place on receiving information about the enemy’s arrival. They were constantly trapped in some catastrophe or the other. 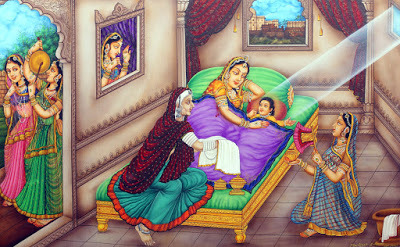 Once the Maharani was roasting ‘bhakris (Indian bread)’ in the forest; after eating their share, she asked her daughter to keep the left over ‘bhakri’ for dinner but at that time, a wild cat attacked and took away the piece of ‘bhakri’ from her hand leaving the princess crying helplessly. That piece of ‘bhakri’ was also not in her destiny. Rana Pratap felt sorry to see the daughter in such state; he got angry with his valour, bravery and self-respect and started thinking whether all his fighting and bravery was worth it. In such a wavering state of mind, he agreed to call a truce with Akbar. A poet named Pruthviraj from Akbar’s court, who was an admirer of Maharana Pratap, wrote a long letter in the form of a poem to him in Rajasthani language boosting his morale and dissuading him from calling a truce with Akbar. With that letter, Rana Pratap felt as if he had acquired the strength of 10,000 soldiers. His mind became calm and stable. He gave up the thought of surrendering to Akbar, on the contrary, he started strengthening his army with more intensity and once again immersed himself in accomplishing his goal. Devotion of Bhamashah: There was a Rajput chieftain serving as a minister in the regime of forefathers of Maharana Pratap. He was very much disturbed with the thought that his king had to wander in forests and was going through such hardships. He felt sorry to know about the difficult times Rana Pratap was going through. He offered a lot of wealth to Maharana Pratap that would allow him to maintain 25,000 soldiers for 12 years. Rana Pratap was very happy and felt very grateful. Initially, he refused to accept the wealth offered by Bhamashah but at his constant insistence, he accepted the offering. 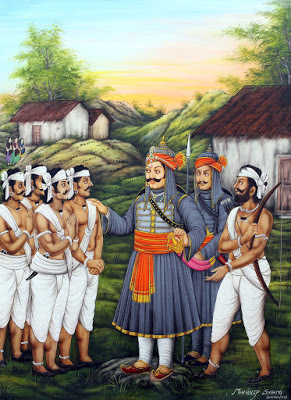 After receiving wealth from Bhamashah, Rana Pratap started receiving money from other sources. He used all the money to expand his army and freed Mewar except Chittod which was still under the control of the Mughals. Last wish: Maharana Pratap was lying on the bed made of grass even when he was dying as his oath of freeing Chittod was not still fulfilled. At the last moment, he took his son Amar Singh’s hand and handed over the responsibility of freeing Chittod to his son and died in peace. There is no comparison in history to his fight with a cruel emperor like Akbar. When almost the whole of Rajasthan was under the control of the Mughal Emperor Akbar, Maharana Pratap fought for 12 years to save Mewar. Akbar tried various means to defeat Maharana but he remained unbeatable till the end. Besides, he also freed a large portion of land in Rajasthan from the Mughals. He underwent so much of hardship but he preserved the name of his family and his Motherland from facing defeat. His life was so bright that the other name for freedom could have been ‘Maharana Pratap’. We pay tribute in his valiant memory! The maid servant announcing the birth of a son (Pratap on May 9, 1540 at Kumbhalgarh) by beating a metal disc. In order to shape the character of her son, Jaianti Bai narrating the stories of good deeds of Pratap’s ancestors. Before the commencement of the training for arms, Pratap worshipped the deity. Soon after Jaimal Rathod starts arms training to Pratap. Pratap developed very intimate relationship with the Bhils, so much so that they used to call him as ‘Kika’ (son). Maharana Udai Singh planning to found his new capital on the site suggested by Yogi Premgiri. When the fall of Chittor fort became inevitable in 1568, so ladies performing ‘Johaur’ at three places in the fort. By the order of Emperor Akbar, Mughal forces mercilessly killing the civil population soon after the capture of Chittor fort by the Mughal. Krishnadas Chundawat and other nobles forcefully removing Jagmal, younger son of Maharana Udai Singh from the throne and requesting Pratap to occupy it. Maharana Pratap seeking the blessing of Mother India, so that he can free the country from the clutches of melechas (Mughals). In the open court Maharana Pratap renouncing all kinds of physical comforts and luxuries till he liberates the mother land from the clutches of foreign invaders. 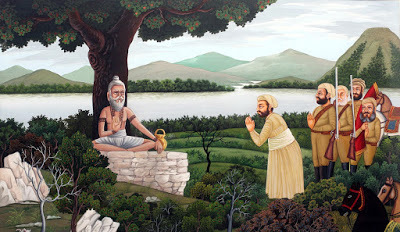 Bhagwantdas the ruler of Amer in Gogunda, handing over the message of Akbar to Pratap. Pratap selecting the horses for his army brought by the Arab traders. Chetak horse was also one of them. 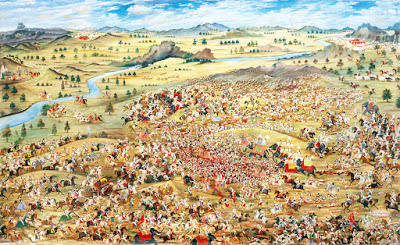 Hakim Khan Sur offering his services with his eight hundred soldiers to Maharana Pratap in his fight against the Mughal imperialism. Pratap holding the open court so that every one can speak freely, frankly and fearlessly about his assessment of the situation. Before moving to meet the Mughal forces at Losing, Maharana Pratap addressing his army and exhorting them to do their best for the cause of liberty of their land. Pratap coming out of a narrow pass. Fierce fighting taking place between the Mughal and Mewari elephants at Haldighati. 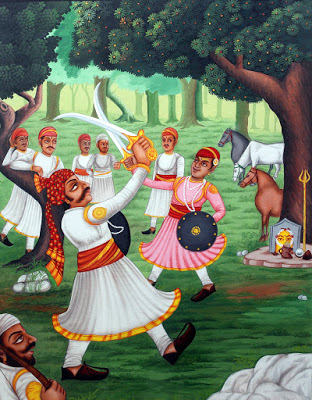 Pratap and Man Singh came face to face in the battle of Haldighati. Pratap hurling his spear at Man Singh. However, Man Singh was saved but his mahut died. Grief striken Pratap with the dead body of his beloved horse Chetak. Medical aid is being provided at Kolyari camp after the battle of Haldighati to all the wounded soldiers and horses including Pratap. Precarious condition of Mughal forces at Gogunda due to fear of sudden attack and closing of supply line by Pratap. Bhama Shah presenting the booty gathered from Mughal territory. It contains enough wealth to pay for a force of 25,000 persons for twelve years. Pratap rebuking his son Amar Singh for his uncultured act of capturing and bringing with him the female members of Abdurahim Khankhana’s family and ordering his son to take back the ladies immediately to Khankhanas camp respectfully. On complaint by the people, Pratap gave deterrent punishment to the person who violated his order not to raise any crop. Amar Singh trust his spear with such a force that the weapon struck in the ground after piercing the strong coat of mail and chaste of Serma Sultan, the Mughal Officer Incharge of Diwer. In the presence of an eminent painter Nishardi the great scholar Chakarpani presenting his work titled ‘Vishva Vakllabha’ to Pratap. Finding no response to the treatment and rapidly deteriorating condition of Pratap, Vaidhya, Kr. Amar Singh and all the represent on his bed side are in a state of shock. Funeral process of Pratap is being taken from the palace at Chawand, was attended by the people from various walk of life. Fascinating, thank you for bringing this to light! Amazing attempt, to let us know these forgotten heroes.